Take a trip through the hidden, underwater world of Atlantis with these magic truffles. With a strong visual effect, you’ll notice the world around you will begin to mold and blend into different objects. Colors and shapes will change. And, more importantly, your perspective will change. Dive into the deep end and discover the magic palaces of Atlantis with this 15 gram pack of magic mushrooms. Stunning Visual Trip. This magic truffle offers surreal visions that can range from seeing various gods and elves to discovering the magic city of Atlantis itself. High Quality for a Potent High. 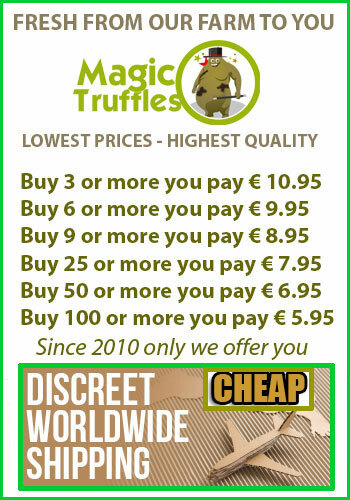 We worry about growing the strongest, high quality and natural truffles so you don’t have to. Safe, non-toxic and harmless. Hangover-free Way of Getting High. Since our truffles are made naturally with no additives and funky chemicals, you won’t feel any negative effects after using it. Balanced and Vivacious Sensations. Get ready to feel lifted to new heights with the Atlantis magic truffles. This is sure to be a unique high that’s not as strong as The Hollandia truffle, although very intense and visual. Great Low Price. We never skimp on quality while keeping our prices low. Producing high quality truffles is a passion. Discover your love of truffles today with the Atlantis truffle packet. This 15 gram pack is perfect for having a great trip or too. Order now! Thank you so much Buy Magic truffles. I ordered these and am writing this review a little late but I had an super experience. For the first time, me and my friend both took 7.5 grams each and although I didn't really see or hear anything different, I felt excellent, euphoric, happy, I couldn't stop laughing at anything! I also felt as though my anxiety was non existent. My friend felt the same way too. It was great I was worried I wouldn't receive the product due to living in the UK so when I saw them in the mail I was ecstatic. Definitely will buy more magic truffles! thank you, again. I love Atlantis! Nice visuals and a few hours fun. Will order again soon.